U.K. network operator EE plans to deliver 4G internet access from a kite-like balloon first developed as an observation and communications platform for the military. The Helikite was invented in the 1990s and has also found favor with Antarctic explorers, disaster relief workers and emergency services. 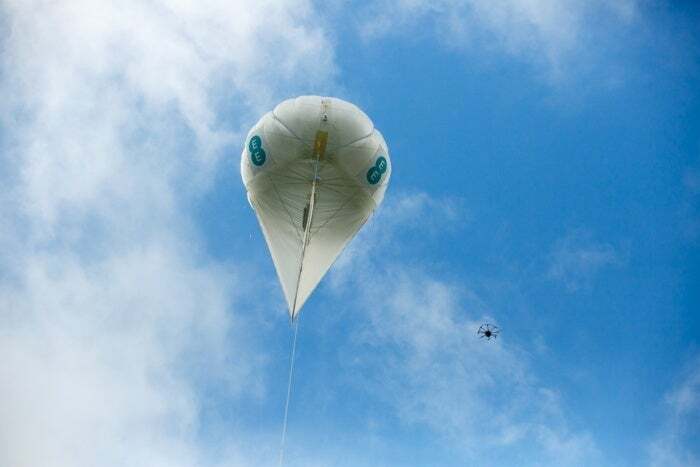 EE revealed its plans to deliver wide-area network coverage from the helium-filled balloons on Tuesday, although it won't have the first one in service until later in the year. According to Allsopp Helikites, the maker of the kite-balloons, hoisting a 4G base station aloft can increase its range from 3 kilometers to between 30 km and 80 km. In a city, that would cause trouble: So many smartphones would be within range that the bandwidth available to any one of them would shrink to a trickle. In sparsely populated areas, though, operators face a different problem, struggling to find enough subscribers to make investing in new base stations economical. By increasing the range of their cells, they can serve a greater area with less equipment. That's important for European mobile networks, which often have territorial coverage obligations written into their operating licenses. EE, for example, must offer 4G service across 92 percent of the U.K. The system is reminiscent of Google's Project Loon. That effort will put wireless internet access points on high-flying helium balloons that can navigate changing air currents at different altitudes to "loiter" over a particular region. In contrast, EE's Helikite-mounted base stations will be tethered to a particular spot and fly at an altitude of about 100 meters. EE is also planning to mount smaller base stations on drones to provide targeted network coverage during search-and-rescue operations. Whether the base station is on a balloon or a drone, carrying data between it and mobile devices is just one of the challenges; building the "backhaul" to link it to the network core is another. For that, EE will use two systems. One, developed by Parallel Wireless, creates a mesh network from adjacent 4G base stations to carry traffic back to a point on the network backbone. Another, developed by Avanti, sends the traffic to the core via satellite.